When marriage plans are in the works, engagement ring shopping is something everyone will have to deal with at one point or another. Believe it or not, shopping for a ring can be an experience you both enjoy. Knowing what to look for in a ring plus the excitement of getting married can make ring-shopping a joy. Finding the perfect band is the first step to selecting the right ring. The band is the part of the ring that is circular and wraps around the finger. It is usually made of platinum, silver or gold and can also be made from a combination of various metals. As you go through the process of ring selection, it is important to determine what band will look perfect on your lady. When buying a band, keep in mind that gold in its natural state is alloyed with other metals for durability and is yellow orange in color. Some prefer light colors such as 10K or 14K. To give an off-white color, white gold is purposely alloyed with metals and can even give off a silver appearance when plated with other metals, like rhodium. Platinum is naturally silvery, strong and hard. Over time, the mirror finish can appear dull. Selecting the right gemstone and setting is the next step. The setting is attached to the band and refers to the way gemstones are arranged in place. Settings can be ‘invisible’ or ‘pronged.’ For the special background gold color to be combined with the strength of platinum, some rings combine a gold band with platinum settings. The main feature of the ring is the gemstone. Traditionally, the diamond is used as the ‘rock.’ According to Hollywood celebs like Elizabeth Taylor when she received a 68-carat diamond from Richard Burton, the bigger the stone, the better. These days, however, it is more important to match the ring to the personality of the person who is going to wear it. Smaller stones work best for busy or athletic women with a lot of movement, for example. Also, keep in mind that gemstones don’t necessarily have to be diamonds. When it come to diamonds, keep the 4 C’s in mind. These are a gemstone’s carat, color, clarity and cut. The 5th C is for cubic zirconia. These are softer than real diamonds but indistinguishable. Another great alternative to diamonds are lab diamonds which cost around ten percent of what a traditional rock would cost. Silver rings plated with rhodium can also be indistinguishable from rhodium plated white gold ones, which are great for savvy spenders. When it comes to an engagement ring, choosing the right band size is of utmost importance. Have a jeweler figure out her ring size by trying to sneak out one of her rings, it this is at all possible. The eyeball approach is sometimes not reliable. These days, the average ring size is 7. Of course, rings can also be resized later on if necessary. Selecting a good jeweler that provides great service will take the engagement ring-buying experience from a good one to a great one Because it is such an important purchase, great customer service and having a wide array of fine jewelry pieces for you to choose from is an absolute must. You will always be able to find the perfect ring in Fort Lauderdale. Whether you are looking for stunning vintage pieces, fine jewelry or watches, it is important to consult with experts who know what they are doing such as Gray and Sons. After all, shopping for jewelry is a big investment. Getting as much help as you can from experts will bring you the best results. When looking for engagement rings in Fort Lauderdale, take your time checking out an array of various styles. At the same time, have an idea of what kind of ring you want to get your fiancée. This will garner the best results. An engagement ring lasts a lifetime and finding the perfect match for your special someone’s ring finger is going to take a bit of time. In Fort Lauderdale, finding accredited jewelry experts like Gray and Sons will help you purchase the perfect ring. Just north of Miami, Fort Lauderdale is a city in the United States known as being a popular destination for spring break with its beaches and convention centers. These days, more and more tourists visit Fort Lauderdale to check out museums, yachts and night life. Whether you want to buy or sell jewelry in Fort Lauderdale, knowing what to look for and how to get the right appraisal is key to getting the best possible deal. Experts such as the staff in Gray and Sons will help you get the best possible appraisal for your fine jewelry pieces. You will be assured of getting a certified gemologist’s thorough analysis not just a rough guess at the value or weight. 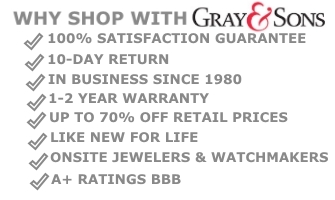 Evaluate the business model of the buyer as well as the length of time they have been in the business – Gray and Sons has been a trusted name in the Jewelry business for over 30 years! Fort Lauderdale Jewelry includes precious engagement rings that will look stunning on your fiancée’s ring finger. Finding a jeweler who is an expert in fine jewelry will help you purchase a ring that meets all your needs and will look perfect on your special someone. When buying jewelry in the area of Fort Lauderdale, buy from experts that have been in the business for quite some time. Jewelry stores like Gray and Sons know the value of a satisfied client and will make sure your visit and patronage is going to be something you will want to repeat over and over again. 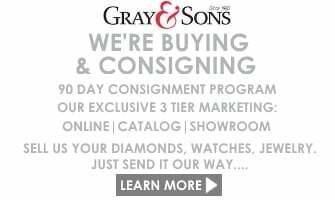 Sell your Engagement Ring and other Jewelry pieces to Gray and Sons, Fort Lauderdale! Gray and Sons sells like-new, meticulously restored one-of-a-kind jewelry pieces and pre-owned watches as well as buys jewelry, all kinds of gold items, loose diamonds, necklaces, and more. Located across the Bal Harbour world-renowned shops, Gray and Sons has been operating a global mail-to-order business for the past sixteen years. With six Swiss-trained in-house watchmakers, Gray and Sons is prepared to handle all your service and watch repair issues.